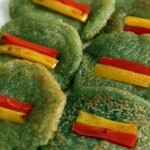 Hi everybody, today I’m introducing you to a Korean regional specialty from Gangwon province called gamjajeon (potato pancakes). Gangwon province is well-known in Korea for its delicious potatoes. Out of all the recipes on my website, this one requires some of the fewest ingredients: potato and a little salt and oil! The first time I ever had gamjajeon was when I was a university student in Seoul, on a class field trip to Seorak mountain park in Gangwon province. Near the entrance to the mountain there was a small restaurant that served gamjajeon and makkoli and the gamjajeon was prepared outside in the open air so I could see how they made it. One woman grated potato after potato, and another had a skillet where she cooked the pancakes as they were ordered. The pancakes were a little brown because grated potatoes oxidize quickly when they’re exposed to air, and the traditional way of preparing them allows them to brown a little. In this recipe I take some steps to keep them from browning, and I also add some buchu to make them green and add flavor. If you want bright white pancakes simply add a bit of salt to the potatoes when you blend/grate them. My American friends thought these tasted a little like potato chips. This sounded funny to me at first, that this Korean regional specialty could taste like an American snack food, but after thinking about it some more it made sense. Both are made of potato and fried with a bit of oil. I know that many of my readers are college students on a budget who like to cook on the weekends with their friends. If you’re one of them, you can get some Idaho potatoes for $3, enlist some of your friends to grate potatoes, and you guys can all make pancakes together and have fun for almost nothing! 10 servings (10 small pancakes) if served as an appetizer, and if served as a snack. Cut the peeled potato into small chunks. Add to a food processor with the water, chopped chives, and salt. Blend well until it’s a creamy purée. Put the purée into a strainer, with a bowl underneath to capture the liquid. Separate the solid from the liquid by gently pressing down with a spoon. Gather the liquid in the bowl underneath and wait for 1 minute for the starch to sink to the bottom of the bowl. Pour out the water and keep the starch. Put it in a bowl with the strained purée and mix with a spoon. Heat up a nonstick pan over high heat. Add a few drops of vegetable oil and then add some of the potato mix, spread nicely into 2 inch discs. Fill your pan with these discs. Turn the discs over when they get brown on the bottom. Add the garnish strips and press them in with a spatula. Cook for 1 minute until the bottom turns golden brown, then turn them over and cook for about 10 seconds, before they get brown. Transfer to a serving plate. Cook all the pancakes this way, until there are no more. Make a dipping sauce in a small bowl by combining the soy sauce and vinegar and sprinkling sesame seeds over top. Serve the pancakes hot with the dipping sauce. Posted on Monday, March 11th, 2013 at 3:03 pm. Last updated on October 5, 2014. Posted June 14th, 2015 at 7:12 am | Log in to reply. Posted July 16th, 2014 at 9:35 pm | Log in to reply. I tried making these with sweet potato and they did not turn out. I could not get them to stay together. Is that because I used sweet potato, or not high enough heat? Posted July 19th, 2014 at 9:51 am | Log in to reply. Posted May 22nd, 2013 at 8:41 pm | Log in to reply. Are there any substitutes for the Asian chives? Posted May 23rd, 2013 at 10:05 am | Log in to reply. How about spinach? Or green part of green onions? Good luck! Posted May 22nd, 2013 at 10:48 am | Log in to reply. I just recently started learning to cook Asian food, and this is by far one of my favorite dishes to cook. It was so easy to make and delicious. I loved your video, it made it much easier to follow the directions. I can’t wait to try more recipes! Posted May 23rd, 2013 at 10:07 am | Log in to reply. yeah, this is one of the easiest recipes and delicious. Besides you don’t need any special Korean ingredients. I’m happy to hear that you enjoyed your gamjajeon! Happy cooking! Posted May 29th, 2013 at 1:54 am | Log in to reply. That was part of the reason I liked it.I didn’t have to drive to the Asian market and by lots of different seasonings. Although, as I get better at cooking I will start trying more Korean flavored dishes. I have to find ones that aren’t too spicy though since everyone in my family is a bit sensitive. Posted March 25th, 2013 at 4:12 pm | Log in to reply. Im new fans here.Today i made Gamjajeon,and it was so yummy and so easy to prepare. Thanks maangchi. I will upload the photos of my creation. Posted March 26th, 2013 at 12:25 pm | Log in to reply. Posted March 14th, 2013 at 4:13 am | Log in to reply. This looks really tasty. 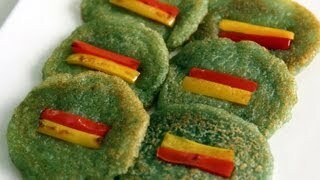 Looks like the little green pancakes we have around here, although the ingredients are different. Ours are made with flour and spinach, or nettle! There are also orange pancakes, with carrot… Now I want to make a pancake feast with different colored pancakes. Thank you for this recipe Maangchi! Orange color gamjajeon sounds great! Posted March 13th, 2013 at 11:48 am | Log in to reply. Posted March 12th, 2013 at 8:24 am | Log in to reply. Miam, seems very good! I will try this when I go back home.. I like the color! I wanted to ask you if you can show us how to make mustard leaf kimchi, I really want to try it but have no idea how to make it! Posted March 12th, 2013 at 8:07 am | Log in to reply. Posted March 12th, 2013 at 2:25 am | Log in to reply. Posted March 12th, 2013 at 12:49 am | Log in to reply. Posted March 12th, 2013 at 9:57 am | Log in to reply. This recipe was originally posted on March 11, 2013 at 3:03 pm by Maangchi. It was last updated on October 5, 2014. The video was watched 412,786 times on YouTube & has 5,197 likes!